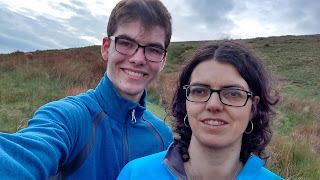 Mark and Luke have been away this weekend on a Scout expedition so after William had finished his revision we went for a walk up Parliick and Fairsnape. It was a lovely evening and we only saw three other people whilst we were there which was quite surprising as when I went up Parlick with Luke and Mark on Wednesday evening there were lots of people around, William said everyone must have been watching the Eurovision song competition! We had a good natter and put the world to rights whilst we were walking, it was nice to spend some time with William on his own and have time to chat.